They say that if a million monkeys were set to write at a million typewriters for a million years, you'd eventually get Shakespeare. Click here to play! What if in that period of time, the monkeys got a handle on the idea of language, and started to write their own stories, actually thinking about what they were writing? What would monkey Shakespeare look like? 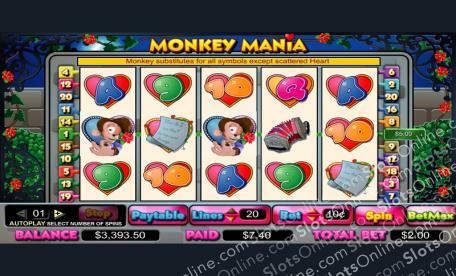 The Monkey Mania slots answer this question to some degree, as you must help Monkey Romeo to win the heart of Monkey Juliet in this fun 5-reel slot. By lining up the right symbols to woo the sweet lady monkey from her balcony and into Monkey Romeo’s arms, you will win fantastic prizes and you may even get a chance to play the bonus game. Would a banana by any other name contain less potassium? Play the Monkey Mania slots, and try to bring a happy ending to this tale of monkey woe by winning the top prize. The Heart symbol is the scatter, paying out on the total bet when 2 or more land on the reels. It also triggers the bonus game when 3 or more land on the reels. The Monkey symbol is wild, and it substitutes for any symbol other than the scatter. The bonus game is triggered by 3 or more scatters landing on the reels. In the game, the player must help the Macho Monkey woo the Lady Monkey, choosing to give a banana, play a song, read a poem, beat his chest, or throw flowers at her. The Monkey Love Meter rises if he is successful, and the level of the meter determines how big the bonus prize will be.